The Saramonic SR-WM4C, a compact and lightweight VHF wireless microphone system - the perfect audio solution for recording simply and easily, free from the limit of distance. The SR-WM4C is ideal for film making, conducting broadcast interviews and business presentations-or any other need that requires portability and great sound quality. The slim, low-profile clip-on omni-directional microphone transmits its signal via a bodypack transmitter to the receiving unit. Both Saramonic receiver and transmitter are lightweight and easy to use - offering ultimate flexibility without sacrificing high-quality audio. The Saramonic SR-AX100 allows you 2 microphones, wireless receivers to any DSLR camera or compact camcorder that feature a 3.5mm aux mini-jack input. The SR-AX100 features a passive circuit making it virtually noise free, no batteries require. 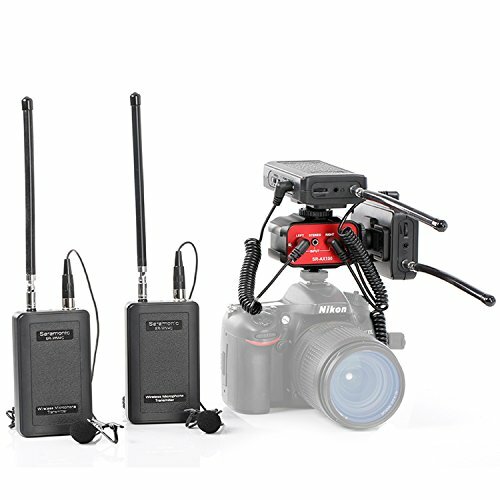 Recording into your device with one to two pairs of wireless lavalier microphone systems, which can be used for two men/women in television news radio, interview and talk show. It brings you perfect recording and shooting experiences. If you have any questions about this product by Saramonic, contact us by completing and submitting the form below. If you are looking for a specif part number, please include it with your message.